Well another Thursday and time for another Create with Connie and Mary Thursday Challenge. This week we have a fun sketch for you! I decided to change it from a horizontal card to a square card. Sometimes I just like this size best! I haven’t used my Sea Street set for awhile and wanted to use the Moonlight DSP again before it was gone. Moonlight dsp paper stack – 15/16 x 1 1/2 – pick 4 different print and add to the Whisper White panel, add Silver Foil strip 1/4 x 3 3/4. Add to Blackberry Bliss 3 5/8 x 3 5/8. Add panel to card front using dimensionals. 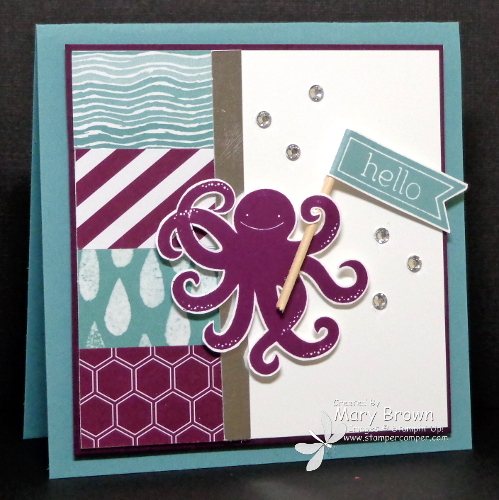 Stamp octopus using Blackberry Bliss, cute out and add to card front using dimensionals. Stamp greeting banner using Lost Lagoon on Whisper White, cut out and add to a toothpick with the ends cut off. Add to card. Add Basic Rhinestones to finish off. This entry was posted in Create with Connie and Mary and tagged Perfect Pennants, Sea Street. Bookmark the permalink. I love this set too Mary and am so glad it’s staying! The purple octopus waving his sentiment flag is very cute and looks great with the Moonlight DSP combo. Such fun! Oh gosh, how cute is this?!?! I love the purple octopus and the DSP work so well with the entire look! Also, the scatteting of rhinestones is a fun touch! What a cheerful “Hello”! I especially love your color choices for this card – very fun! Love this Mary! This is too cute. Love how the DSP imitates the motion of water, very creative!